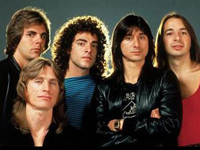 By 1977, however, the group decided it needed a strong vocalist/frontman and hired Steve Perry (born January 22, 1949). The results were immediately felt on the fourth album, Infinity (1978), which sold a million copies within a year. (By this time, Dunbar had been replaced by Steve Smith.) Evolution (1979) was similarly successful, as was Departure (after which Rolie was replaced by Jonathan Cain). Following a live album, Captured (1981), Journey released Escape, which broke them through to the top ranks of pop groups by scoring three Top Ten hit singles, all ballads highlighting Perry’s smooth tenor: “Who’s Crying Now,” “Don’t Stop Believin’,” and “Open Arms.” The album topped the charts and sold millions. Frontiers (1983), featuring the hit “Separate Ways,” was another big success, after which Perry released a double-platinum solo album, Street Talk (1984). When the group got back together to make a new album, Valory and Smith were no longer in the lineup and Raised on Radio (1986) was made by Schon, Perry, and Cain, who added other musicians for a tour. Following the tour, Journey disbanded. Perry went into a prolonged period of seclusion as Schon and Cain formed Bad English with vocalist John Waite. Bad English had several hit singles, including the chart-topper “When I See You Smile,” before breaking up. Perry returned to recording in 1994, releasing For the Love of Strange Medicine. Although the album went gold, it was a commercial disappointment by previous standards. In 1996, Perry, Schon, Cain, Valory, and Smith staged a Journey reunion, releasing the million-selling Trial by Fire, which featured the gold-selling Top 20 single “When You Love a Woman,” and going on tour. Perry and Smith opted out of the reunion after the tour, but Journey continued, hiring a new lead singer, Steve Augeri (formerly of Tall Stories), and a new drummer, Bad English’s Deen Castronovo, who made their debuts on “Remember Me,” a track on the 1998 Armageddon soundtrack.